Toronto's 2012 budget debate is over, but the war of words continues as Mayor Rob Ford's allies and opponents trade barbs. 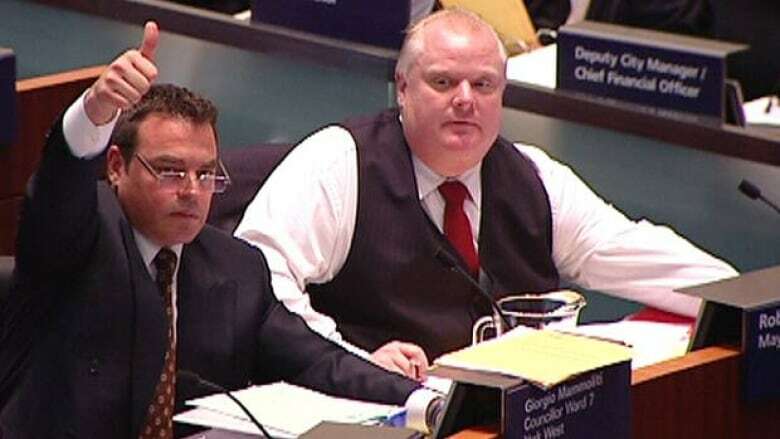 Toronto's 2012 budget debate is over, but the war of words continued Wednesday as Mayor Rob Ford's allies criticized councillors who pulled back from about $20 million worth of cuts. Coun. Giorgio Mammoliti, one of Ford's strongest proponents, said the reduced cuts won't get the city much in return. "We got some staff that are going to show up to a daycare with no children in it," he told reporters. "We have some pools that are going to stay open a little longer that may or may not actually have people swimming in them, when they can go down the street to swim. We're right back to the drawing board in some of these cases." The $9.4-billion budget, which passed 39-5 Tuesday evening, contains a 2.5 per cent property tax increase, but council backed away from about $20 million in cuts Mayor Rob Ford had been championing. Much of that reduction was due to a surprise omnibus bill delivered by Coun. Josh Colle, which passed 23-21. Mammoliti was unimpressed: "All the constituents out there in Toronto that pay taxes should know that they just spent $15 million to make Josh Colle happy," he said. Mammoliti said Colle had been used by council's left-leaning councillors, whom he accused of purposely withholding their agenda until the last minute. Mammoliti said he plans to introduce a motion in February to reduce the number of councillors from 44 to 22. "That will make for a more expedited approach to decision-making in council," he said. Coun. Doug Ford, the mayor's brother, said the money to stave off cuts — which was taken from an unexpected $154-million surplus — was a Band-Aid solution. Ford compared the surplus (most of which will go to TTC capital projects) to an individual winning the lottery: "Would you pay down your mortgage and pay down your credit cards, or would you go out and spend carelessly? The problem is they’re going out and spending carelessly because it’s not their money. It’s not respect for taxpayers." Coun. Adam Vaughan, a vocal Ford critic, said the vote signalled that the balance of power had shifted. "What the mayor is now being told [is] 'You don't change your approach, nothing you propose is getting through council easily anymore,' " he said. Coun. Josh Matlow, a swing vote who lined up against Ford on Tuesday, said he can still work with the mayor. "If the mayor proposes something that I agree with, then of course he'd earn my support," Matlow said. "But there's a difference between earning one's support and just taking it for granted." Budget chief Mike Del Grande, asked about a rumour that he was unhappy and stepping aside, said he'll be in his position until at least the summer. "We've made some tremendous strides," he said, noting that the 2012 budget is smaller than last year's. Del Grande said the job affected his health, leaving him with tendonitis and some illnesses caused by stress. The controversy around the 2012 budget led to hundreds of people protesting outside City Hall on Tuesday evening, with Toronto police barricading the doors and arresting four people. TTC chair Karen Stintz said Wednesday that $5 million in cuts to the transit system that council reversed on Tuesday can't be used to save routes, because there's no money to maintain them. "We can't make a commitment to maintain those routes, so it will be my recommendation to the commission that we either use it for streetcars or buses or [supporting the transportation of dialysis patients] or a combination of the three," she said. Toronto police said that pepper spray was used during the protest but that it's not clear who fired it. A few tents pitched by Occupy Toronto protesters Tuesday were still near City Hall on Wednesday afternoon. Tomas Anbrozaitis, one of the remaining protesters, said he's not done fighting even though the budget has passed. "I think it's important to show solidarity and support for a movement that's growing, a growing movement of dissent," he said. Ford dismissed the protesters as "the same 500 people" that show up at every demonstration.